cute card. love your colors! Interesting technique! Beautiful card! Your blog looks great!! Have a blessed day! this is a sweet card shelly... ive scrolled thru you older posts and love your cards and style..
looking forward to visiting you again...and again.. Double bugging........haven't tried that one yet either. Looks great and loving your new blog too! very very cute!!!! 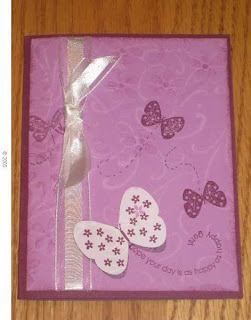 Love the stamp set you used on this!! !